Not to be confused with Russneft. PJSC Rosneft Oil Company (Russian: Росне́фть, tr. Rosnéft', IPA: [rɐsˈnʲeftʲ] stylized as ROSNEFT) is a Russian integrated energy company headquartered in the Russian capital of Moscow. It is specializing on exploration, extraction, production, refinement, transport, and sale of petroleum, natural gas, and petroleum products. The company is controlled by the Russian government through the Rosneftegaz [ru] holding company. Its name is a portmanteau of the Russian words Rossiyskaya neft' (Russian: Российская нефть - Russian oil). Rosneft was founded in 1993 as a state enterprise and later incorporated in 1995, acquiring a number of state-controlled gas and oil assets. 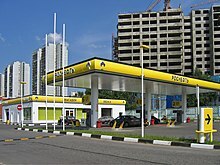 Rosneft became Russia's leading oil company after purchasing assets of former oil company Yukos at state-run auctions. After acquiring OJSC TNK-BP in 2013, then one of the largest oil companies of Russia, Rosneft became the world's largest publicly-traded petroleum company. Rosneft is the third largest company of Russia and the second-largest state-controlled company after Gazprom in Russia in terms of revenue (₽4,134 billion). Internationally, it is one of the largest oil companies, ranking 24 in terms of revenue. The company operates in more than twenty countries around the world. Rosneft had played a major role in the history of Russia's oil industry. The first mentioning of the name Rosneft dates back to the late 19th century, where exploration of oil fields in Sakhalin began in 1889. Most of Rosneft's current assets were established during the Soviet era. Rosneft was established in 1993 as a unitary enterprise with assets previously held by Rosneftegaz, the successor to the Soviet Union's Ministry of Oil and Gas. During the early 1990s, almost all Russian oil companies and refineries were extracted from Rosneft to form ten integrated companies. Later their number was halved as a result of acquisitions. On 29 September 1995, an Order of the Government of Russia № 971 transformed Rosneft into an open joint stock company. Rosneft struggled financially and operationally during the 1998 Russian financial crisis with decreased production due to poor assets and decreased retail sales with an underused refining capacity. In October 1998, the Russian government appointed Sergey Bogdanchikov as president. The company owned two obsolete refineries and several low-productive and poorly managed oil-producing assets. In the late 1990s, plans for Rosneft's privatization in Russia were made, but due to competition with equally influential pretenders, they were not carried out. From 2002 to 2004, the main objectives of the company were to strengthen control over its assets, reduce the debt burden, and to obtain licenses in Eastern Siberia. The determining factor in enhancing the role of Rosneft in the Russian oil industry has been the support of the country's top leadership. The company, during this time, managed to restore its status after its rough start in the 1990s with the acquisition of Krasnodar Oil and Gas Company in 2002 and Northern Oil Company in early 2003. In addition, in 2002, the company received a license for the development of the Sakhalin-V project, and in 2003 a license for the development of the Sakhalin-III project. By 2005, Rosneft became the leading oil company of Russia in terms of production. In 2007, the company for the first time entered the annual list of one hundred most respected firms and companies in the world according to the weekly Barron's, in 99th place. By the same year, Rosneft produced 100 million barrels of oil, 20% of Russia's output at the time. In March 2007, Rosneft had announced it hoped to increase production from 80 million tonnes to 103 million tonnes from 2006 to the end of 2007, extract 140 million tonnes of oil by 2012, and become a global top three energy company. When the Great Recession struck Russia in late 2008, Rosneft was able to endure the economic pains by improving and strengthening business lines, management, and transparency, and as a result, became a leading oil company domestically and internationally. In February 2009, a number of agreements were negotiated between Russia and China that provided a 20-year contract for an annual supply of 15 million tons of oil between the Chinese National Petroleum Corporation (CNPC) and Rosneft, cooperation between CNPC and Transneft to construct and operate a branch of the Eastern Siberia–Pacific Ocean (ESPO) oil pipeline to China, and the provision of loans for US$25 billion—US$15 billion from Rosneft and US$10 billion from Transneft—by the China Development Bank on the security of supplies. Starting in 2004, the Russian government organized a series of auctions to sell the assets of Yukos Oil Company, of which Rosneft won the majority. On December 22, 2004, Rosneft had purchased Baikal Finance Group which bought Yuganskneftegaz (Yugansk), a main asset of Yukos, three days earlier at a state-run auction for US$9.35 billion to satisfy tax debts. According to some estimates[who? ], this operation was directed by Russian authorities in order to nationalize Russia's oil and gas industry. In response to the deal, Andrei Illarionov, then a senior Putin economic advisor, denounced it as "fraud of the year". The purchase of Yugansk greatly increase the number of assets and production for Rosneft. Subsequently, Rosneft filed a lawsuit against Yukos in connection with the use of the understated transfer prices for the purchase of oil from Yuganskneftegaz prior to its breakup. At the same time, according to some reports[who? ], Rosneft itself also purchases oil and gas from its subsidiary, Yuganskneftegaz, at transfer prices. In May 2007, Rosneft won a number of auctions for the sale of Yukos' assets, including five refineries and oil companies Tomsk Oil Company and Samara Oil and Gas Company, making it the largest oil company in Russia. According to experts on the Russian newspaper Vedemosti, the assets of Yukos, bought by Rosneft at auction organized by the state, went to the company at a discount of 43.4% of the market price of this property. In 2007, the former assets of Yukos provided 72.6% of oil and gas condensate production and 74.2% of Rosneft's primary refining. In June, Rosneft paid $731 million for the transportation assets of Yukos, which had declared bankrupt in August 2006 after three years of litigation over tax arrears. In August, Bogdanchikov said that although the Yukos acquisitions had increased Rosnefts debt to $US 26 billion, he planned to reduce debt to 30% of total assets by 2010 by tripling refining capacity and expand into China. On July 2006, Rosneft placed 15% of its shares traded with a total value of US$10.7 billion in an initial public offering (IPO) at the London Stock Exchange, the Russian Trading System, and the Moscow Interbank Currency Exchange. Part of the shares were distributed among the Russian population through banks such as Sberbank and Gazprombank. The Federal Service for Financial Markets authorized the placement and circulation outside the country of a 22.5% stake in Rosneft. Rosneft announced a placement value of US$5.85–US$7.85 per share and global depository receipt (GDR), based on the company's capitalization after consolidation of US$60–80 billion. It was planned to place shares for at least US$8.5 billion in order to repay loans to Western banks, including interest and taxes. On July 14, the official results of the placement value were announced. Shares were priced at US$7.55, almost at the upper end of the price band, resulting in Rosneft's capitalization—taking into account the upcoming consolidation of its subsidiaries—at a value of US$79.8 billion, making Rosneft surpass Lukoil as the largest oil company in Russia. Investors bought 1.38 billion shares for US$10.4 billion: 21% of the shares were bought by strategic investors, 36% from international investors from North America, Europe, and Asia, 39% from Russian investors, and 4% from Russian retail investors. 49.4% of the total IPO volume accounted for four investors, including BP for US$1 billion, Petronas for US$1.5 billion, and the CNPC for $0.5 billion. Individuals were submitted applications for the purchase of 99,431,775 shares of the oil company, and as a result, most of the new shareholders were individuals; partly because of this IPO was given the unofficial name of "people's." Rosneft's IPO became the largest in the history in Russia and the fifth in the world in terms of the amount of money raised at the time. The announced amount could increase by another US$400 million if the global placement coordinators realize the option of buying another 53 million GDRs of Rosneft at the price of placement within 30 days. On May 26, 2009, a five-year cooperation agreement was negotiated between Rosneft and the Abkhazia's Ministry of Economy. The parties stated their intention to develop mutually beneficial cooperation in areas as geological prospecting, development of oil and gas fields, production of hydrocarbons, and sale of oil, natural gas and oil products. Rosneft undertook exploration on the shelf in the Ochamchira area, discovering preliminary reserves estimated at 200 million to 500 million tons of oil equivalent. In addition to drilling and creating its own sales network, Rosneft also planned the construction of mini-refineries in Abkhazia. According to Rosneft, the company provides more than half of the retail sales of oil products in Abkhazia. In 2014, Rosneft exported 47 thousand tons of oil products to Abkhazia. Since 2015, Rosneft started supplying aviation fuel for Sukhumi Babushara Airport. As part of the project to develop the Gudauta area on the Black Sea shelf, Rosneft will carry out a full range of geophysical and geochemical research, conduct 2D and 3D seismic surveys, and start preparations for exploratory drilling. In June 2014, Rosneft extended the shelf study period to five years. In July 2015, however, the new President of Abkhazia, Raul Khajimba, who replaced Alexander Ankvab after his resignation, spoke out against the exploration and production of oil on the offshore shelf of Abkhazia and asked the People's Assembly to consider the possibility of establishing a "commission for the comprehensive study of issues related to the conclusion of contracts for exploration and production hydrocarbons by the previous Abkhaz leadership." A group of deputies of the People's Assembly drafted a bill banning the development of hydrocarbons in Abkhazia. Supporters of the bill demanded the prohibition of the development of the offshore shelf in Abkhazia for 30 years. In September 2010, Eduard Khudainatov replaced Sergei Bogdanchikov as CEO of the company. On October 15, 2010, Russian President Dmitry Medvedev signed an agreement with President of Venezuela Hugo Chavez for the PDVSA to sell 50% of the shares of German company Ruhr Oel to Rosneft, giving Rosneft oil refining assets in Germany. Since May 23, 2012, former Deputy Prime Minister Igor Sechin became the company's CEO, succeeding Khudaninatov, who received the post of vice-president. In the summer of 2012, Rosneft purchased a fuel oil terminal from the United Shipbuilding Corporation (USC) located on the territory of the Murmansk Ship Repair Plant No. 35. The transaction value is estimated at US$28 million. According to Kommersant, the Murmansk terminal can be used as a platform for Rosneft's activities in the Arctic. On October, 2016, Rosneft bought a 49% stake in Essar Oil of India, along with Russian investment fund United Capital, in a deal worth $13 billion. On December 7, 2016, Rosneft signed a deal to sell 19.5% of the outstanding shares, or roughly US$11 billion, to the Anglo-Swiss multinational commodity trader Glencore and the Qatar Investment Authority. Officially, the stake was split 50/50 between Glencore and Qatar, but Glencore contributed only €300 million and claims only a 0.54% stake. The ownership structure includes a Cayman Islands company, QHG Cayman Limited, whose ownership can not be traced. After the transaction, Rosneft's holding company Rosneftegaz retained 50% + 1 share of the company. On October 2, 2017, the PLA-linked CEFC China Energy bought a $9 billion stake in Rosneft. September 26, 2017, the Russian government controversially approved the former German chancellor Gerhard Schröder as chairman of Rosneft. In May 2018, it was announced that the Qatar-Glencore consortium is cancelling the plan to sell a $9.1 billion (14%) stake of Rosneft to CEFC China Energy. With the dissolution of the consortium, the Qatar Investment Authority purchased the shares instead, thereby solidifying its position as one of the biggest shareholders (19%) of Rosneft. In the 2010s, the extensive contact between Rosneft and ExxonMobil were further deepened, with Igor Sechin and Rex Tillerson getting to know each other personally. On 15 January 2011, Rosneft and British Petroleum (BP) announced a deal to develop the East-Prinovozemelsky field on the Russian arctic shelf between the Yamal Peninsula and Novaya Zemlya island. As part of the deal Rosneft was to receive 5% of BP's shares, worth approximately $7.8 billion, as of January 2011 and BP would get approximately 9.5% of Rosneft's shares in exchange. According to the deal, the two companies would create an Arctic technology centre in Russia to develop technologies and engineering practices for safe arctic hydrocarbons extraction. AAR, which represents four billionaires of Russian origin and is BP's Russian partner in the TNK-BP joint venture, blocked the BP–Rosneft deal in international courts, arguing it breached earlier contracts between BP and AAR. The TNK-BP partners had previously signed a shareholding agreement which stipulated that their Russian joint venture would be the primary corporate vehicle for BP's oil and gas operations in Russia. On 30 August 2011, Rosneft announced that instead of BP the partner for EPNZ-1, EPNZ-2 and EPNZ-3 in the Kara Sea will be ExxonMobil. In exchange, subject to approval by U.S. regulators, in addition to a share in oil production in Russian fields, Rosneft was granted participation in U.S. fields in Texas and the Gulf of Mexico. On 27 January 2011, Rosneft and the American company ExxonMobil signed a deal to establish a joint venture for the purpose of prospecting and extracting oil from the Tuapse field deepwater area on the Black Sea shelf, near the coast of the Krasnodar Krai. The value of the deal is unknown, but ExxonMobil is expected to invest $1 billion in the project. The venture will be shared 50–50 between the companies during prospecting phase, and 2/3 – 1/3 in Rosneft's favour during the extraction phase. The Tuapse Trough is estimated to contain 7.2 billion barrels of oil equivalent. The first well could be drilled in 2012. The deal also contains options for additional cooperation, such as extended exploration and production, deliveries to Rosneft's oil refinery in Tuapse, development of transport infrastructure and research on offshore oil production technologies. According to analysts, offshore areas are central to Rosneft's expansionist plans, and the company is looking for foreign cooperation to bring in new technology and share risks. In April 2017, the Trump administration has denied ExxonMobil permission to continue a deal with Rosneft to drill for oil in Russia. On 22 October 2012, it was announced that Rosneft will take over TNK-BP International, a parent company of TNK-BP Holding, which is the third largest oil company in Russia. BP will receive in exchange of its stake $12.3 billion of cash and 18.5% of Rosneft's share, while ARR will receive $28 billion in cash. According to Rosneft's CEO Igor Sechin, no discussion had been held on a buyout of minority shareholders in TNK-BP Holding. The deal was completed on 20 March 2013. On July 16, 2014, the Obama administration imposed sanctions through the US Department of Treasury's Office of Foreign Assets Control (OFAC) by adding Rosneft and other entities to the Sectoral Sanctions List (SSL) in retaliation for the ongoing Ukrainian crisis, annexation of the Crimean Peninsula by the Kremlin, and the Russian interference in Ukraine. Prior to the initial public offering (IPO) in 2006, all of Rosneft's shares were owned by the Russian government through its holding company JSC Rosneftegaz [ru]. After the placement of the company's shares on the stock exchange and the consolidation of shares of 12 subsidiaries (including Yuganskneftegaz) of Rosneft, the share of Rosneftegaz decreased to 75.16%. As of September 2012, Rosneft had over 160,000 shareholders. By December 2016, the number of individual shareholders was 138,000, with Rosneftegaz owning only 50% of the shares, BP owning 19.75%, and 30.25% owned by other shareholders. In 2011, according to Rosneft, the company had donated $422 million to charity, 4 times than the previous year, becoming the leading Russian company devoted to philanthropy that year. At the same time, the composition of the beneficiaries were not disclosed as it was known that the oil company had previously committed to pay $180 million for the right to be the general sponsor of the 2014 Winter Olympics in Sochi. Since 2012, Rosneft, along with Gazprom, is the title sponsor of the association football team FC Tom Tomsk based in Tomsk. Rosneft has been ranked as among the 13th best of 92 oil, gas, and mining companies on indigenous rights and resource extraction in the Arctic. In October 2009, the Federal Antimonopoly Service (FAS) imposed on Rosneft a record fine of ₽5.3 billion for violating anti-monopoly legislation. The fine was imposed for the abuse of power in the petroleum market recorded in the first half of 2009, which was expressed in the "seizure of goods from circulation, which led to higher prices in the wholesale segment of the oil products market, creating discriminatory conditions for the sale of oil products to individual counter-parties." As FAS has calculated, these actions led to an increase in prices in the wholesale markets of motor gasoline, diesel fuel, and aviation kerosene in the first half of 2009. A former subsidiary of Yukos, Yukos Capital Sarl of Luxembourg, is seeking justice from Rosneft to repay debts of companies that previously belonged to Yukos. On August 9, 2010, after the seizure of Rosneft's assets in the United Kingdom and the denial of appeal by the Supreme Court of the Netherlands, Rosneft said that Yukos Capital paid Yuganskneftegaz its debt of ₽12.9 billion. On August 16, 2010, Yukos Capital appealed to the Federal Arbitration Court of the West Siberian District with a cassation appeal against the decision of the Arbitration Court of Tomsk Oblast to refuse recovering from Tomskneft, a Rosneft subsidiary, more than ₽7 billion under loan agreements. Previously, Yukos Capital applied to international arbitration under the International Chamber of Commerce, and it obliged Tomskneft to pay ₽7,254.2 million, $275.2 thousand, and ₤52.96 thousand, with an interest rate of 9% per annum for the amount of ₽4,350 million, starting from February 12, 2009 until the day of payment of the debt. The Russian court had to bring the court's decision to Russian territory. However, the Arbitration Court of Tomsk Oblast, having considered the claim, ruled to refuse Yukos Capital in debt collection. In the first half of the 2000s, Sergei Bogdanchikov, then president of Rosneft, along with some journalists and experts, criticized Yukos and Sibneft for their use of hydraulic fracturing. However, in early November 2006, a number of journalists pointed out that the Priobskoye oil field of which it is owned by RN-Yuganskneftegaz, a subsidiary of Rosneft acquired from Yukos, produced the largest oil fracture in Russia with specialists of Newco Well Service. The operation was conducted for seven hours and was broadcast live via the Internet to the office of Yuganskneftegaz. In 2007, the company planned to perform hydraulic fracturing of the formation at 440 wells. From 2009 to 2010, Rosneft remains one of the largest customers of the oilfield services company Schlumberger, which specializes in hydraulic fracturing. The Russian branch of Greenpeace called Rosneft the dirtiest oil company in the world. In 2011, according to a survey conducted by the Federal Service for Supervision in the Sphere of Nature Management (Rosprirodnadzor) in Khanty-Mansi Autonomous Okrug, Rosneft allowed 2,727 oil spills, which is 75% of the total number of spills that occurs under the company. According to environmentalists, it is Rosneft's fault that more than 10,000 oil spills occur each year. As of May 1, 2014, the heads of Russian state corporations would provide information about their incomes and property to the Russian government to correspond to the presidential decree Anti-Corruption Issues, which was published on July 8, 2013. According to the ruling, websites of the companies should show personal information of their top managers such as income, property, spouses, and children. However, Rosneft refused to publish its information of top managers, citing that it is only applicable to "state companies (corporations) and other organizations created by federal laws," to which it does not believe itself as. However, this did not prevent the company from providing information of the incomes and property of its top managers and their families to "competent authorities" in the prescribed "time and amount". According to the director of the Russian branch of Transparency International, Elena Panfilova, improvement of such legislation is necessary so that state corporations can unequivocally interpret the norm on the publication of personal information. In July, the Russian government announced that information of the income of top management of companies listed in Government Decree No. 613 of July 22, 2013 which includes Rosneft, "are subject to placement in the information and telecommunications network 'Internet' on the official websites of these organizations." ^ a b c d "Consolidated financial statements Rosneft Oil Company for the year ended December 31, 2017" (PDF). Rosneft. Retrieved 24 October 2018. ^ a b "Rosneft at a glance". www.rosneft.com (in Russian). Retrieved 2 March 2018. ^ a b c "History". www.rosneft.com (in Russian). Retrieved 2 March 2018. ^ Ведомости (2 March 2018). "РБК узнал о задержании замначальника таможни Дагестана". Retrieved 2 March 2018. ^ "Новости, анализ, прогнозы в сфере экономики и бизнеса, общества и политики". expert.ru. Retrieved 2 March 2018. ^ a b c d e f g "History". www.rosneft.com (in Russian). Retrieved 3 March 2018. ^ AFP (9 March 2007). "Russia's Rosneft Aiming to Become Top Global Oil Company". petroleumworld. Elio Ohep Fitzgerald. Archived from the original on 10 May 2015. ^ "Putin's Advisor Calls Yuganskneftegaz Sale "Fraud of the Year" - MONE…". archive.is. 29 December 2004. Archived from the original on 29 December 2004. Retrieved 21 March 2018. ^ "Rosneft Gets More of Yukos". Oil & Gas Eurasia. June 2007. Archived from the original on 8 February 2012. Retrieved 27 August 2007. ^ "Rosneft Goes on Absorbing Yukos". Russia Today. 7 August 2007. Archived from the original on 28 February 2008. Retrieved 27 August 2007. ^ ""Роснефть": "народное IPO" обернулось скандалом". ipocongress.ru. 9 June 2010. Archived from the original on 2 February 2012. Retrieved 22 March 2018. ^ "ОАО "НК "Роснефть""". Газета "Коммерсантъ". 9 June 2010. p. 9. Retrieved 21 March 2018. ^ "Пресс-центр". www.rosneft.ru (in Russian). Retrieved 22 March 2018. ^ a b "Пресс-центр". www.rosneft.ru (in Russian). Retrieved 22 March 2018. ^ a b "Власти Абхазии вытесняют "Роснефть" из страны". vestifinance.ru. Retrieved 22 March 2018. ^ "Решением Совета директоров Президентом ОАО "НК "Роснефть" назначен Эдуард Худайнатов". rosneft.ru. 9 June 2010. Retrieved 22 March 2018. ^ "Совет директоров назначил Сечина президентом "Роснефти", Худайнатов стал его замом". Газета.Ru. Retrieved 22 March 2018. ^ ""Роснефть" вышла на причал в Мурманске". Газета "Коммерсантъ". 17 July 2012. p. 9. Retrieved 22 March 2018. ^ "How Russia sold its oil jewel: without saying who bought it". Reuters. 25 January 2017. ^ Ведомости (8 December 2016). "Glencore: цена покупки пакета "Роснефти" – 10,2 млрд евро". Retrieved 22 March 2018. ^ "Власти утвердили Шредера кандидатом на пост главы "Роснефти"". runews24.ru (in Russian). Retrieved 22 March 2018. ^ N. Hume and D. Sheppard (May 4, 2018). "Qatar and Glencore scrap plan to sell $9bn Rosneft stake to CEFC". Financial Times. Retrieved June 1st 2018. ^ a b c d e Overland, Indra; Godzimirski, Jakub; Lunden, Lars; Fjaertoft, Daniel (2013). "Rosneft's offshore partnerships: The re-opening of the Russian petroleum frontier?". "Polar Record". 49 (249): 140–153. ^ "Rosneft Strategic Alliance with BP" (PDF). Rosneft. January 2011. Archived from the original (PDF) on 30 October 2012. Retrieved 30 January 2011. ^ "BP and Russia in Arctic oil deal". BBC News. 14 January 2011. Archived from the original on 2 November 2011. ^ "Rosneft and BP Form Global and Arctic Strategic Alliance". Rosneft. 14 January 2011. Archived from the original on 28 May 2012. ^ "AAR files new suit against BP in bid for $10 bln compensation". Sputnik. 15 August 2011. Retrieved 29 January 2015. ^ Yenikeyeff, Shamil (23 November 2011). "BP, Russian Billionaires, and the Kremlin: A Power Triangle That Never Was" (PDF). Oxford Energy Comment. The Oxford Institute of Energy Studies: 18. Retrieved 24 November 2011. ^ Flynn, Alexis; Gronholt-Pedersen, Jacob (18 May 2011). "BP, Rosneft Still in Talks". The Wall Street Journal. (subscription required). Archived from the original on 17 May 2013. Retrieved 22 May 2011. ^ "ExxonMobil in $3.2bn Rosneft Arctic pact". Upstream Online. NHST Media Group. 30 August 2011. (subscription required). Archived from the original on 7 October 2012. Retrieved 31 August 2011. ^ Vasilyeva, Nataliya (30 August 2011). "Rosneft Teams Up with Exxon Mobil in Arctic Deal". Bloomberg Businessweek. Associated Press. Archived from the original on 2 November 2012. Retrieved 24 October 2012. ^ a b Oliphant, Roland (28 January 2011). "Exxon, Rosneft Sink $1Bln in Black Sea". The Moscow Times. Archived from the original on 20 March 2014. ^ "Rosneft and ExxonMobil to Develop Black Sea Resources". Rosneft. 27 January 2011. Archived from the original on 28 May 2012. ^ "U.S. will not give Exxon permission to drill in Russia". Reuters. 21 April 2017. ^ Korsunskaya, Darya; Callus, Andrew (22 October 2012). "Rosneft beefs up with TNK-BP purchase". Reuters. Archived from the original on 22 February 2014. Retrieved 22 October 2012. ^ Lehane, Bill (23 October 2012). "Sechin points to multi-billion TNK-BP synergies". Upstream Online. NHST Media Group. Archived from the original on 1 March 2014. Retrieved 24 October 2012. ^ "Rosneft finalizes TNK-BP deal, becomes world's largest oil producer". RT. 21 March 2013. Archived from the original on 29 April 2014. Retrieved 25 March 2013. ^ Soldatkin, Vladimir; Callus, Andrew (22 March 2013). "Rosneft pays out in historic TNK-BP deal completion". Reuters. Archived from the original on 14 February 2014. Retrieved 25 March 2013. ^ "Ukraine-related Sanctions; Publication of Executive Order 13662 Sectoral Sanctions Identifications List". treasury.gov. 16 July 2014. ^ "Announcement of Treasury Sanctions on Entities Within the Financial Services and Energy Sectors of Russia, Against Arms or Related Materiel Entities, and those Undermining Ukraine's Sovereignty". treasury.gov. 16 July 2014. ^ a b "Business". www.rosneft.com (in Russian). Retrieved 7 March 2018. ^ a b "Geological prospecting". www.rosneft.com (in Russian). Retrieved 7 March 2018. ^ "ФСФР поддержала А.Навального в борьбе с "Роснефтью"". РБК. Retrieved 7 March 2018. ^ "Сечин воспользовался кредитом для покупки акций "Роснефти"". РИА Новости (in Russian). 29 August 2013. Retrieved 7 March 2018. ^ "Board of Directors". www.rosneft.com (in Russian). Retrieved 7 March 2018. ^ "Management board". www.rosneft.com (in Russian). Retrieved 7 March 2018. ^ Ведомости (6 February 2012). ""Роснефть" проявила неожиданную и невиданную благотворительность". Retrieved 7 March 2018. ^ ""Томь" подписала спонсорские соглашения с "Газпром нефтью" и "Роснефтью" - Газета.Ru | Футбол россии". www.gazeta.ru. Retrieved 7 March 2018. ^ ""Роснефть" поставила штрафной рекорд". Газета.Ru. Retrieved 21 March 2018. ^ ""Роснефть" выплатила Yukos Capital 13 млрд рублей". РИА Новости (in Russian). 9 August 2010. Retrieved 21 March 2018. ^ "Yukos Capital развивает успех". Газета.Ru. Retrieved 21 March 2018. ^ "ВЕДОМОСТИ — деловая газета. Новости, аналитика, прогнозы". www.vedomosti.ru. Retrieved 21 March 2018. ^ "На месторождении "Роснефти" в Югре произведён крупнейший в России гидроразрыв пласта". www.nakanune.ru. Retrieved 21 March 2018. ^ "Выступление президента нефтесервисной компании "Шлюбмерже" в Ханты-Мансийске. // Advis.ru". www.advis.ru. Retrieved 21 March 2018. ^ "Как самая грязная нефтяная компания России будет сохранять чистоту Арктики? | Гринпис России". www.greenpeace.org (in Russian). Retrieved 21 March 2018. ^ "Белый медведь доплыл на льдине до Кремля | Гринпис России". www.greenpeace.org (in Russian). Retrieved 21 March 2018. ^ "Правительство подтвердило обязанность Сечина публиковать декларацию о доходах". Slon.ru. Retrieved 21 March 2018. Wikimedia Commons has media related to Rosneft.